For those of you who have never used or heard of Remind, it is essentially a messaging app that allows educators to send/receive messages from students via their phone or computer. Students have the option of downloading the Remind app for their device, or signing up with either email or text messages. If you are having trouble getting messages to your students via email or even Google Classroom, here are a few ideas for using Remind. Two-way conversations--using Remind allows you to have a secure way of messaging students either as a whole class, for small group, or even individuals. Want to get a feel for how the day's lesson went? Send your exit ticket to the entire class and have them respond to your message. Need to have a check-in with a small group on their project, but ran out of time in the block? Select only the students in that group from your contacts and ask them to send you feedback. A student was absent from class? Send a quick message to check in on them or to send them an summary of the day's activities. Weekly Parent Updates--contacting home doesn't only have to be for the students who are struggling. At the start of the year/semester, send home a letter to the parents with the code for a special Parent/Guardian Remind class. Then, at the end of each week, send home a quick update on what the students were studying. If you do this from your phone, you can also attach a picture you might have taken of the students' working on a project. Sub-Plans--ever have a sub that completely ignores your sub plans and nothing gets done during the block? No longer. If you are going to be out, even in an emergency situation, send your sub plans to your students via Remind. You can even attach files from Google Classroom, Google Drive, Quizlet, or your computer. Students will need the Remind app (or go to the Remind website) to view the files, but now you know every student received the correct instructions. If they have any problems with the assignment, they can message you right back on the message you sent. Add a Co-Teacher--Are there 2 Educators in your room during class? Add the other person as a co-teacher on your Remind class. Now either of you can send messages or communicate with students! Reach Students While On Break--the first day back from break is tough for everyone. Keep their brains engaged in your class by sending out daily challenges for them. You have the ability to schedule messages so write them all out before you leave for break and schedule one to be broadcast each day. Ask the students to bring the results of their daily challenges on the day everyone returns. Remind is completely secure so not only will you have none of the students' phone numbers, they won't have yours. Also, all messages are recorded by Remind just in case someone decides to make a bad choice in language. If you would like more tips, check out the Remind blog for great ideas. Alexis Wiggins' blog and a video of her students using the method to discuss Romeo and Juliet. Models By Design--how one teacher moved from the Harkness method to Spider Web Discussions. 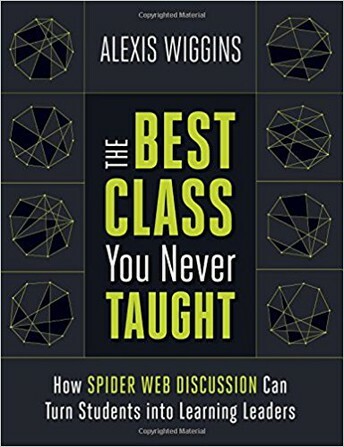 Alexis Wiggins' wiki page--this has not been updated recently, but it does contain a variety of rubrics and other resources to use in your classroom. Dayna Laur's blog--Dayna describes in detail what the entire process was like in her classroom when she decided to move to Spider Web Discussions. Middletown HS South has been selected to participate in a beta program with Google Expeditions called #LoveWhereYouLive. We have been the ability to create our own Google Expedition related to Middletown, Monmouth County, and New Jersey. Marc Seigel is looking for Teachers or Students who are willing to take some 360 degree photos, write a description, and possibly record audio for various locations around our area. If you, your students or your entire class would like to get involved, please email Marc. No idea what a Google Expedition is? Reach out to Marc any time and he will guide you through one.